The Shanghai to Hangzhou Highspeed Train will officially launch at the later half of October, 2010. Today, the headline news is, the train experimented to run at 416.6 km/hour (259 miles/hour). At commercial operation, the train will link Shanghai and Hangzhou. It takes about 40 minutes to get to Hangzhou from Shanghai Hong Qiao Railway Station, running at 350 km/hour (217 miles/hour). The current D-Train, the fastest, is about 2 hours. 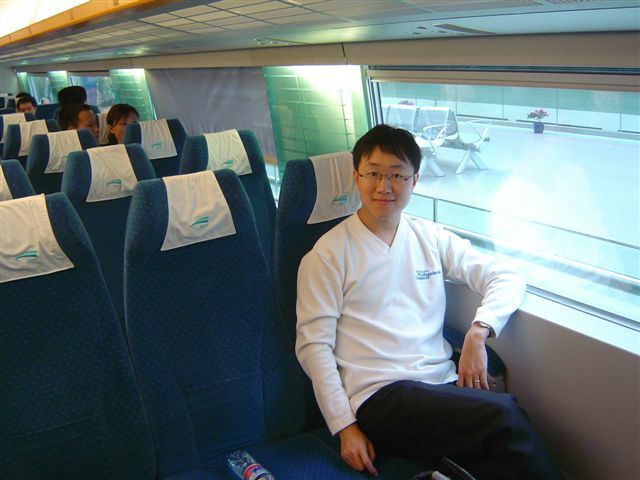 It seems we can take the high-speed train for our meeting in early November in Hangzhou. I am embarrassed that, as a blogger, I still didn’t experienced the new high-speed train. Before I am aware of it, the high-speed train system has run 7055 km. Well. 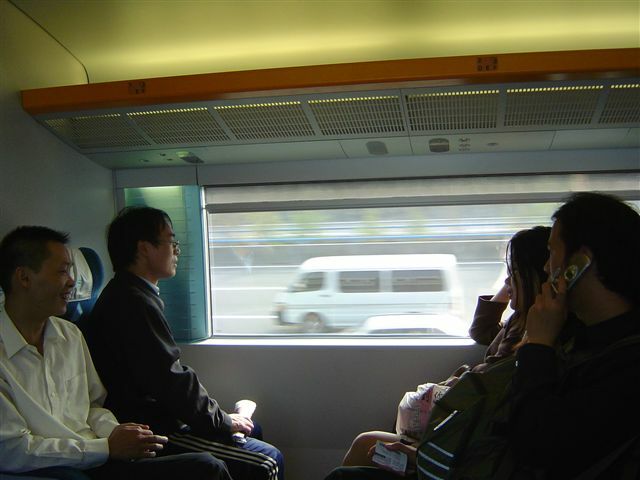 When did I first heard of the concept of high-speed train in China? 5 years ago, I guess. I will send back report when I personally experience it. I do have two photos to share. It is taken on the way back from Weihai to Shanghai. 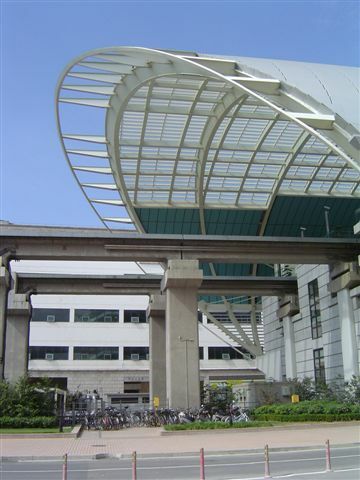 I GUESS, the photo below is picture of a station along the train line. Below is the bird’s view of the line. I GUESS it is the highspeed train line because – it is very straight – to keep it as straight as possible so trains can run really fast, and it is all the way elevated. 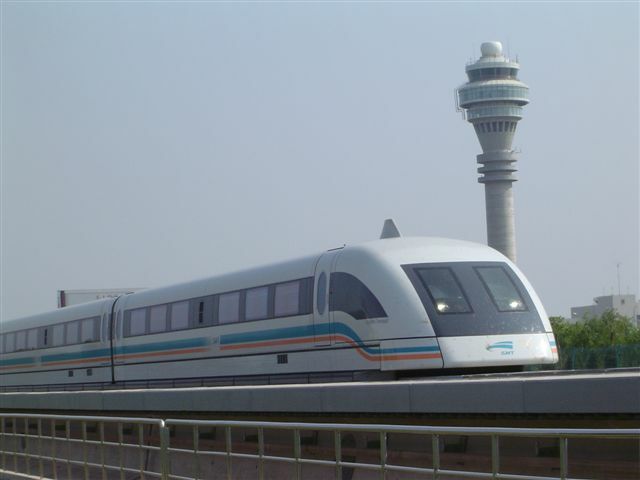 This is a FAQ from my reader – "Whether taking Maglev from Hongqiao Airport to Pudong Airport save me time?" i have visited your site a few times, thanks for the information, it helped us( newcomers) going from Vancouver to Shanghai. We are going back to Vancouver very soon, we will transfer the flight from Hongqiao to Pudong, because of the tight transfer time, we are planning to take a taxi to longyang road first, then take maglev train to pudong airport. I have a coupe of questions for you. 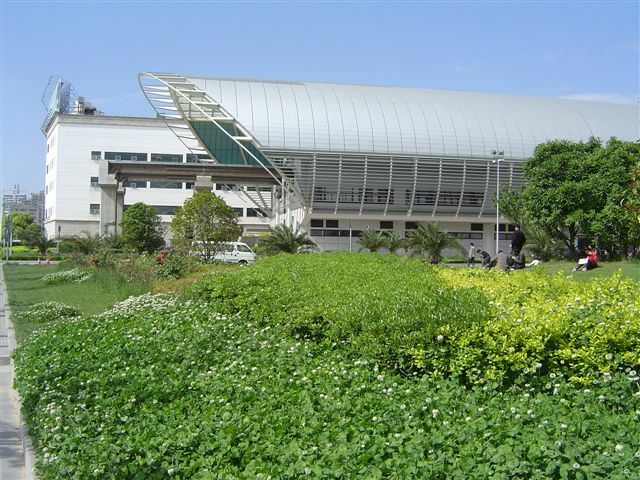 1. how far does it take for taxi from hongqiao airport to longyang station? and How much does taxi cost? 2. 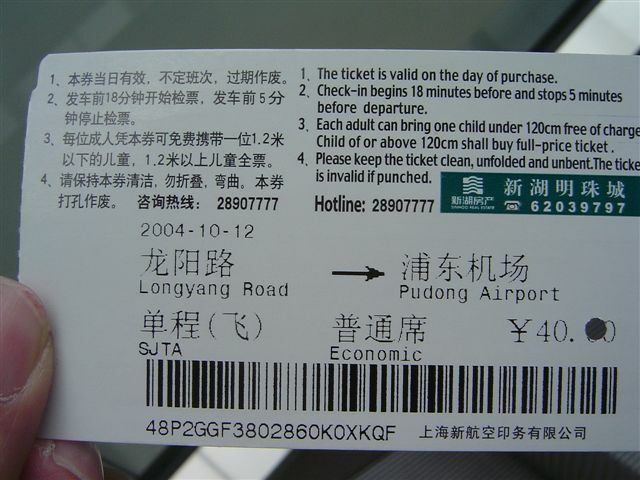 From longyang station, can we buy maglev train ticket right from the counter? or do I have to book the tickets first? Can we carry luggage on the train? We are hoping to save time on airports tranfer, do you think it is a good idea to take the above route, or do you have other suggestions? Please advice, thank you for your help! 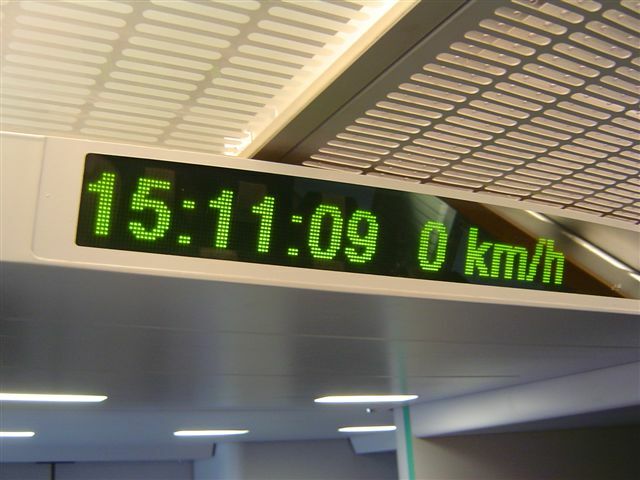 The Maglev (photos)is fast, however, it is not a good idea to get to the train station. The best way to get to Pudong Airport to Hongqiao or Hongqiao to Pudong by taxi is to directly go along the A20 + A1 highway. That is the fastest way. If you The two airports are just at the entrance of the highway system, and it takes about 1 hour to get there. 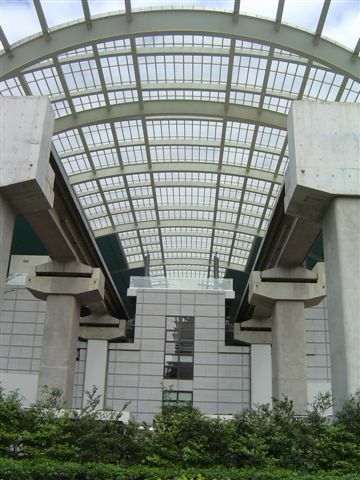 Maglev station is pretty in the center of Pudong, and it takes much longer to leave the express way and get to Maglev station. It does not save time. Actually, you should plan for more time to get to Maglev. Then, with the 15-20 minutes interval of Maglev, 7 minutes ride, and maybe another 10 minutes walk from Maglev station to Pudong airport, it is very slow. 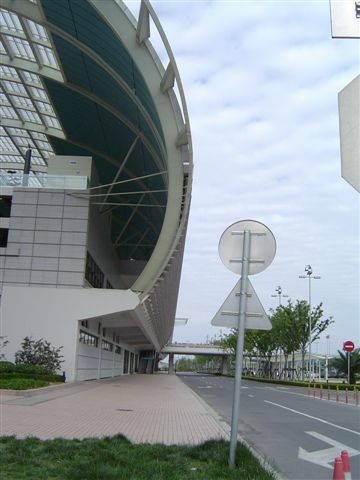 If you take a taxi, it can take you from arrival hall of Hongqiao directly to the departure hall of Pudong, and it is the fastest way (a cheaper alternative is to take Airport Bus #1, which is also very fast since it goes on the expressway with no stops in the middle). 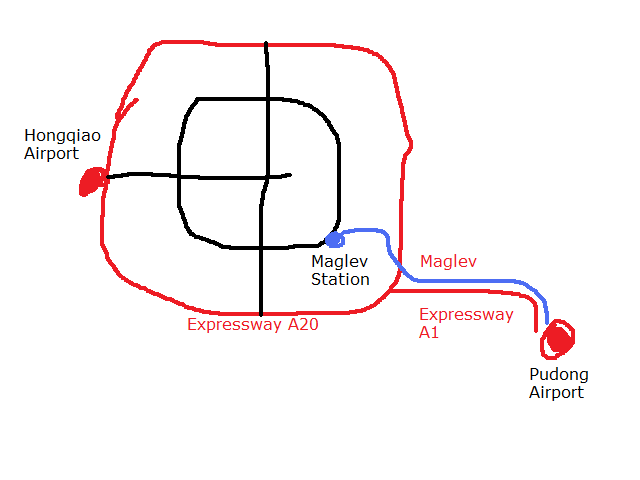 As you can see the diagram below: The red lines are expressway and is preferred. The black line is elevated highway (inner Ring), but traffic is higher. On the cost wise, it is cheaper to take taxi directly to the airport if you consider Maglev ticket (40 RMB per person) if you have two or more people. For Maglev ticket, you can get it at the counter (I even don’t think you can book it in advance). Luggage should be OK with Maglev (I have photos from inside and outside). However, I don’t think you need to use Maglev in this trip if your time is limited. The headline picture of Sina.com.cn caught my attention at 21:50, when I reviewed today’s news in my living room. 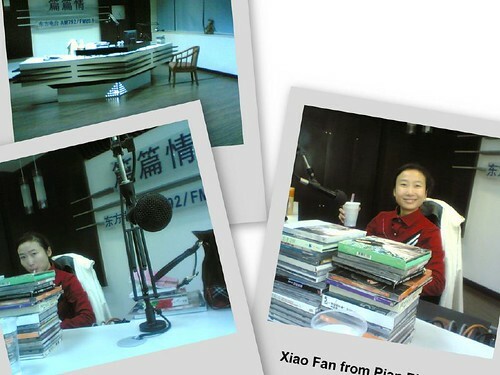 (This is maybe one of the 3 times I checked Sina this month, instead of daily one year ago). The news is about Maglev, my favorite topic. At 2:40 PM, when the train left Long Yang Road Station to Pudong Airport, the fire alarm of one cart of the train was triggered. 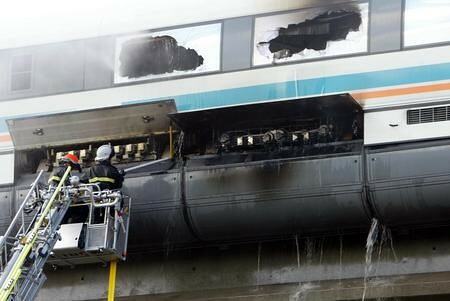 The fire was quickly put off, and all passengers was rescued. What a piece of surprising news! This may strongly hit people’s confidence about the Hangzhou-Shanghai Maglev Line. Here are the pictures from the news website. The ladder (from the first cart on the right), and the rescue tube (the middle cart) are interesting. It is not easy to rescue from that a high place. 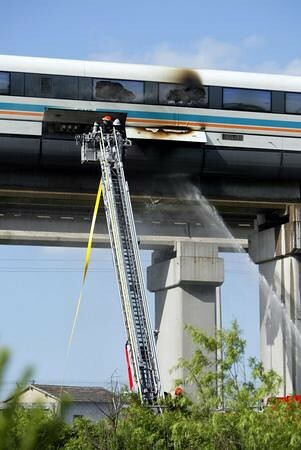 What a coincident that Maglev just held the rehearsal for fire emergency (CN) in May this year. It seemed to help. 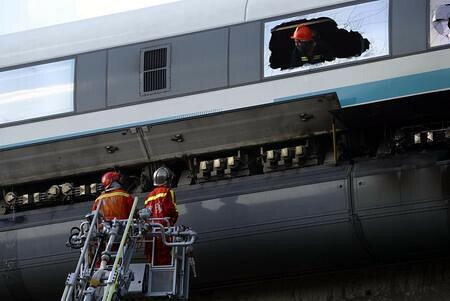 Accident to this kind of high-tech train raise passengers’ concerns as much as problems of a aircraft… How bad it is! Half an hour between Hangzhou and Shanghai. It is good news. I hate to way until 2008, though. I am happy that where I live now is 3 km away from the Maglev station at Longyang Road. It is amazing to be able to get to Hangzhou within 30 minutes. If so, to get to West lake will be within one hour – 10 minutes to Maglev, 30 minutes to Hangzhou (if I arrange the time well), and 20 minutes to West Lake. This is almost the same time from my apartment to Xujiahui (45 minute)! I believe my life will be different if it does happen. How about the Residential Area? One question I have is, how the government will deal with the Wanbang City Garden – the newly built residential garden just at the extended direction of the Maglev. Will they be teared down? Will the Maglev use the other path? 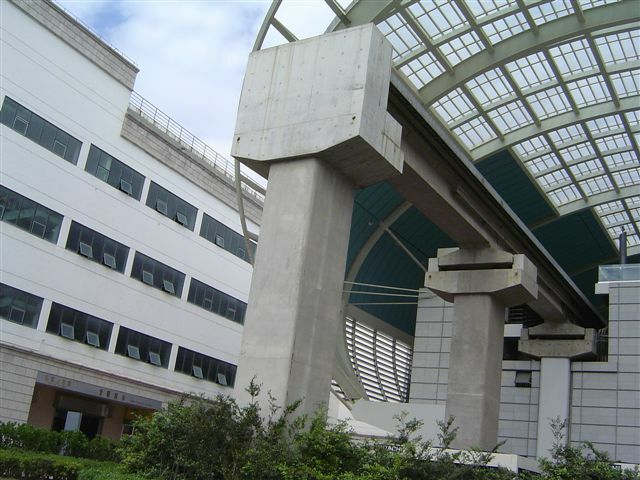 I am also curious about the plan of the rail of Maglev. I may pass the place where I live, since the area is just in the middle between Long Yang Road and the World Expo 2010 site. Anyone know some insight about the plan? Sitting in the Larkspur Landing hotel in San Jose, I missed Shanghai a little bit, just like I missed Maglev. I mean I actually missed it when I left my home and went to Pudong Airport in Shanghai. 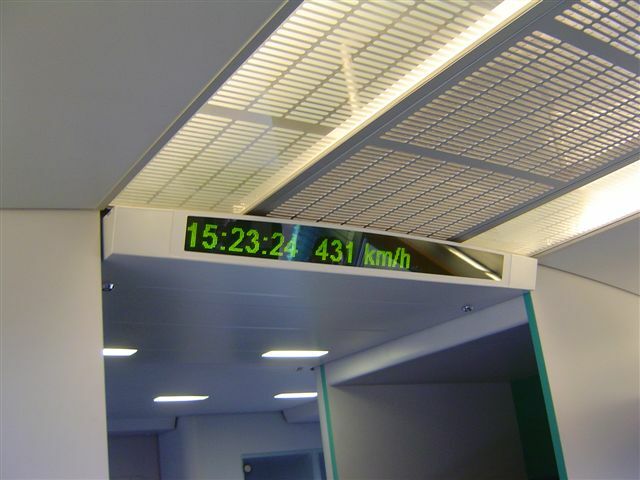 I found out that the speed of Maglev is actually 64 km/h, instead of the 430 km/h from a traveler’s perspective. The calculation is easy. When I pull my luggage (a bag and a laptop) on to the taxi, the driver asked where I were going. I said “Maglev station”. The driver asked me: “Are you going to the Pudong Airport? How about I directly send you there?” I know the driver definitely want me to get to PVG. Well. It is a question without easy answer. What about the fare? Maglev takes 40 RMB + 13 RMB taxi = 53 RMB. For taxi, it is 94 RMB. I am running out of time already. I finally took the taxi approach. The 30 minutes well compensated to my overnight work last night. 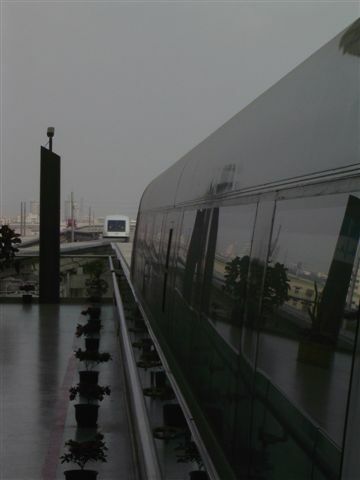 When my taxi is heading to the viaduct to the terminal station, the Maglev flied away beside us. 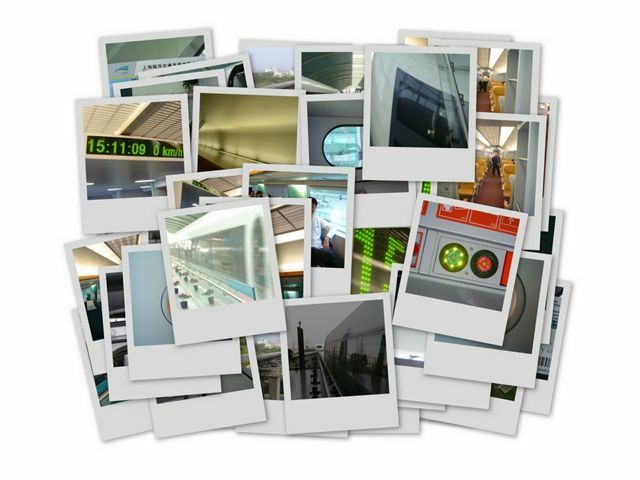 From the tourist’s perspective, Maglev is really cool. 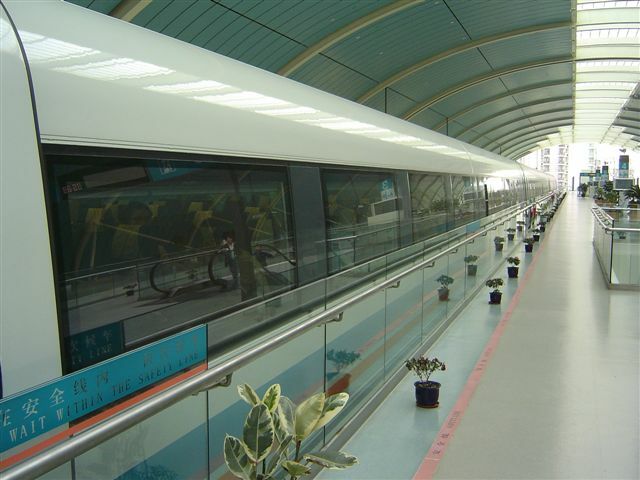 From a business traveler’s perspective, the speed of Maglev is not that good than a taxi. The entrance of the Sillicon Valley is Stanford University. At the back of the University campus, there is a small garage where HP started. Beside HP is a short street. Many two to three story buildings line up along road, with logos like HP, Apple, eBay, Yahoo!…. I don’t know how I formed this impression of Sillicon Valley. Maybe it is because of the legend that Sillicon Valley started from the garage of HP, or the joke that “when you goto the street of Sillcon Valley and say you have a project, a lot of VC will jump out to you”, or the fact that many people jump from one company to the other frequently… It turned out San Jose is not that near to Stanford (at least not within walking distance) and there is no all-star street there. It is a quiet place that is no difference from other small towns in U.S. It is my first time to take a ride of the Maglev train. It is also the first time I was able to choose a flight that departs before the Maglev closes (17:30). The experience is quite impressive. When the train reaches speed higher of 300 km/h, the image out of the window, especially the cars on the nearby A1 Highway become a little bit blur and my eyes cannot catch them. It is absolutely impossible to recognize how many people on board on each car. It is quite interesting visual experience. The highest speed during the trip. It lasted for less than one minutes and went back to 430 km/h, 429 km/h…. 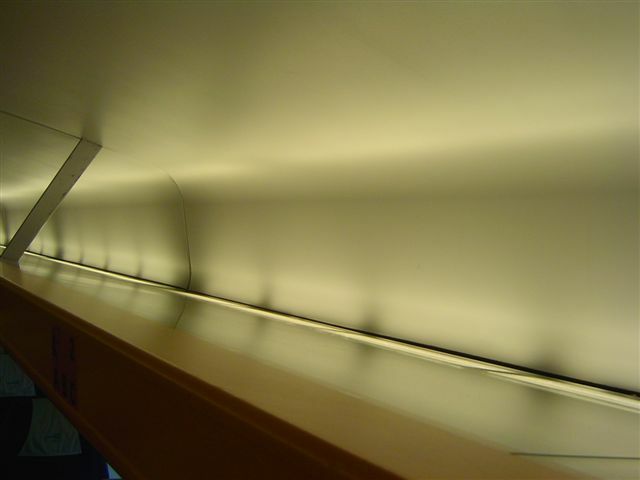 Thanks to Spanky, who posted the following comment under my article: Maglev – A Failure?. I found the information very valuable and quoted the comment in this seperate post. Of cause all credit goes to Spanky. This new mode of traveling (Maglev + taxi) reduces the amount of time on the road and costs for transfer from Pudong airport to the hotel in Puxi. My total transfer costs came up to ¥80 (¥40 for Maglev + ¥40 for taxi). 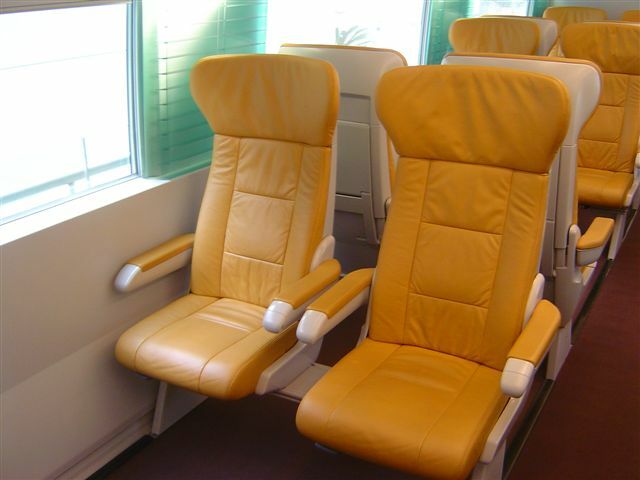 However, it will cost more than taxi fare (¥120-150) if there are three or more passengers traveling together. There won’t be much time saving if the passenger misses the connecting Maglev and has to wait about 15-20 minutes for the next one. I must say that this mode of traveling is also not suitable for passengers with more than a carry-on luggage. This is because there are about five flights of escalators and some walking involved (no trolley available at the tunnel connecting airport to Maglev station and Longyang station). 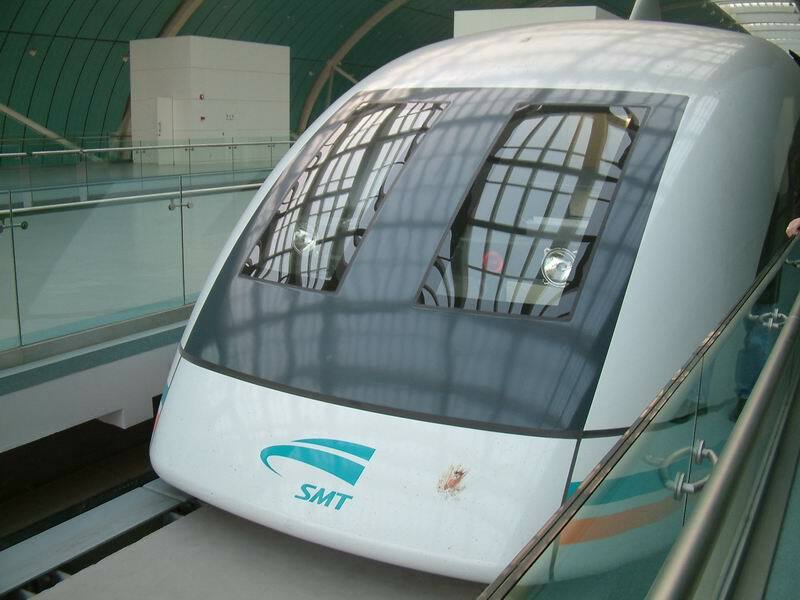 The Maglev currently runs between Longyang and Pudong from 8.30 am through 5.30 pm at every 20 minutes interval. 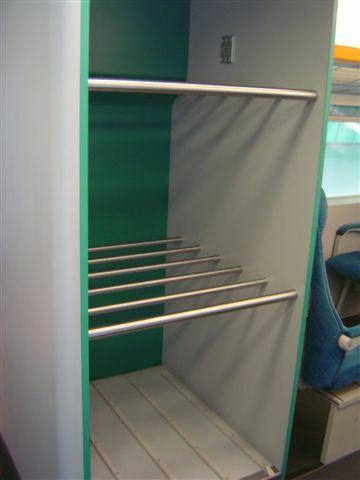 There are racks above the seats and between cabins for luggage. 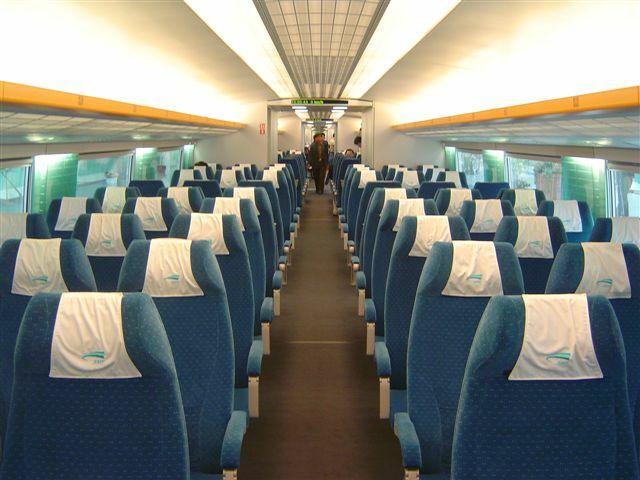 I do not think it’s necessary to pay twice as much to travel on first class as it is a very short ride and there are few users now (more Maglev tourists than transfer passengers). I agree that an official website should be set up fast to create more awareness among travelers and encourage higher usage. Some advertisements at the airport will certainly attract arriving passengers to use the service. The overall experience was good and I will still ride on Maglev the next time I go to Shanghai. 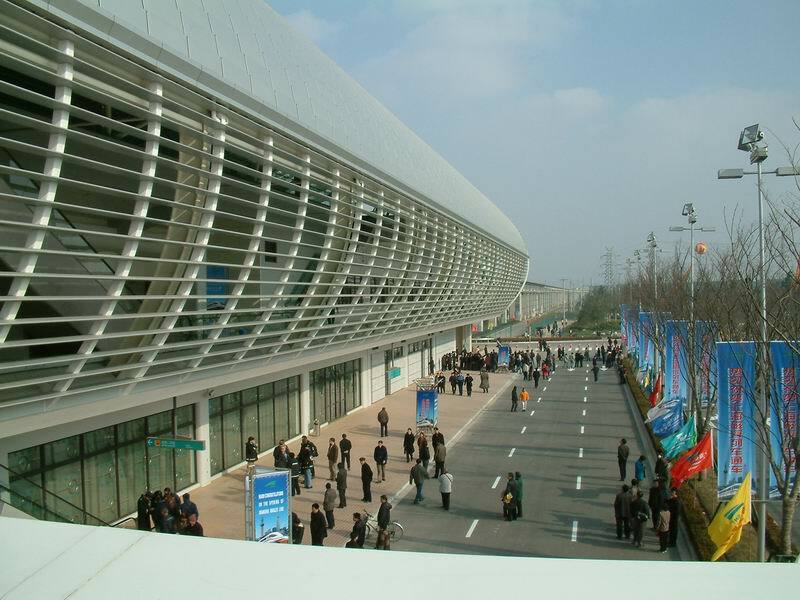 Although the Maglev connecting Pudong Airport and Long Yang Road Station attracted much attention, more and more factors show that it is a failed project. It seems I still have to help promote the service via this website better than before. There is no official website for Maglev yet. 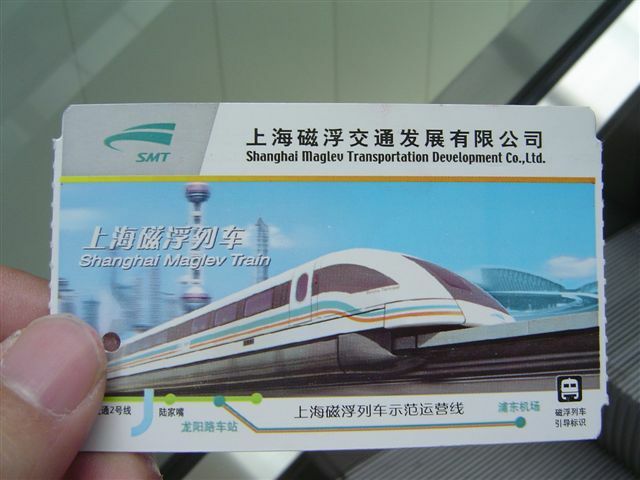 If you search for “Maglev Shanghai” in Google, my article returns as the first entry in the result. I hope there is an official website that by pass mine and become the first, so they may double the passenger numbers so there is only 2500 years to break-even day for Maglev. Updated: According to Alexandre, it was a mistake in news. It should be 73 persons/trip. 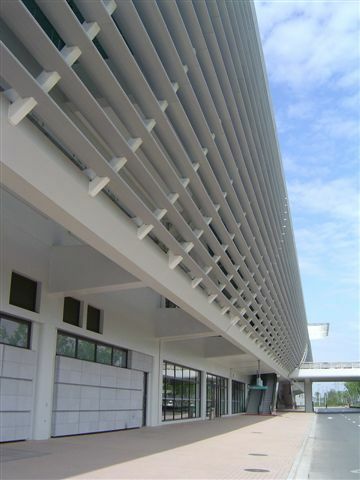 Attached are some pictures taken by Morning from impolo.com at the begining of this year after the MagLev just srated trail. Nice picture! It seems the train just hit a bird on the head. The blood is still there. Poor bird! It seems the birds still didn’t get used to live with the train yet. 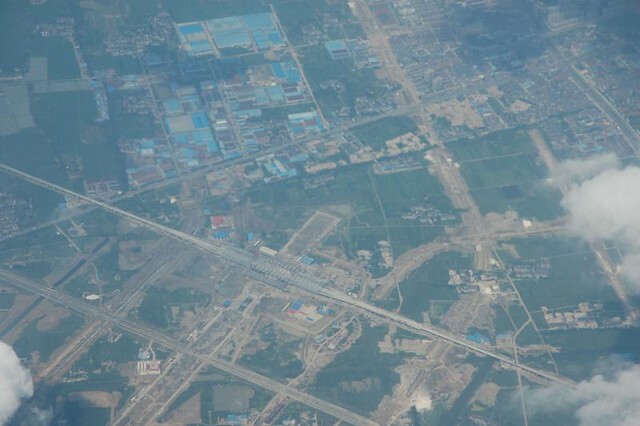 Below is the picture of the Longyang Rd. Station at the other end of the rail. The latest update about the Maglev is, the formal operation will start from Jan of next year. Nice news for Maglev fan, isn’t it? 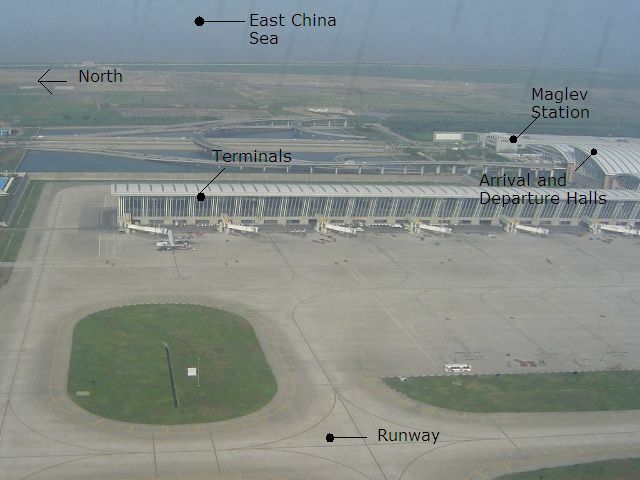 Location of Maglev Station Guide about Maglev Station at PVG. 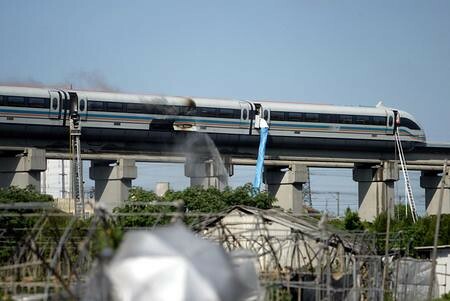 Maglev is really hot recently. I can tell from the number of emails I received asking about the operation of Maglev. There is no such kind of good information on the web yet. 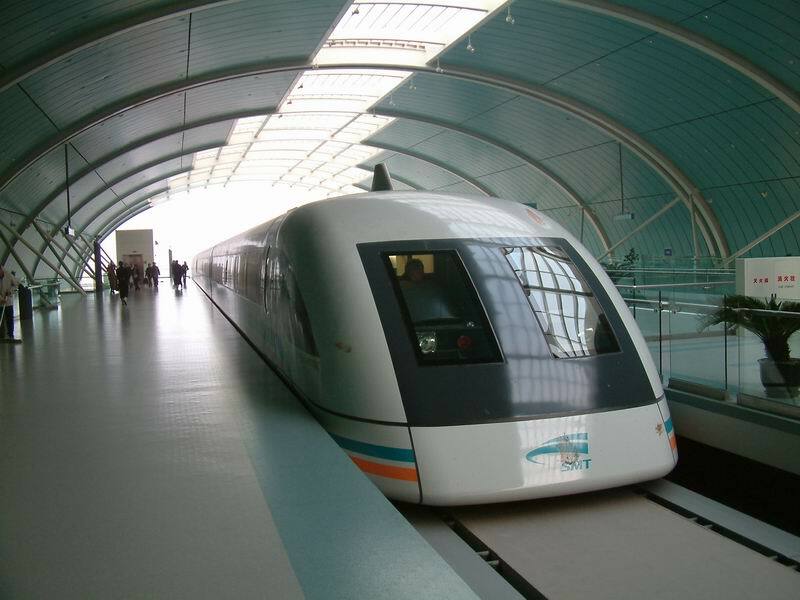 Now the Maglev has started to take passengers at Pudong Airport and drop them off at Long Yang Road Station. The price for single trip is 75 RMB. 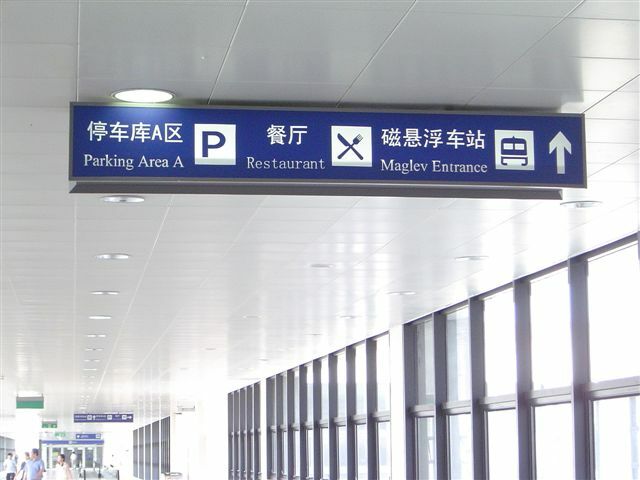 Is the way to the maglev train from the arrivals area clearly marked? Are there signs in English as well as other languages. Well. It may not be easy for people to find the station. Since there is not sign for the Maglev yet at the International Arrival Hall. You will get very confused when you get there. It is another proof of the poor usability of Pudong Airport. I feel it is my responsibility to post some pictures about how to get to the Maglev station. 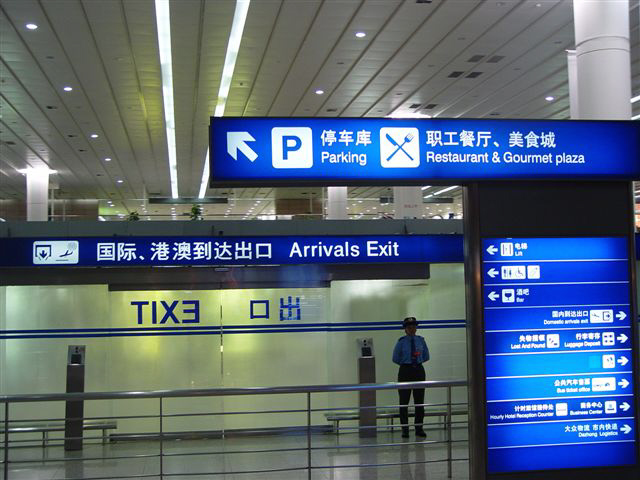 After you get out of the International Arrivals Exit (shown below), find the sign pointing to Parking. 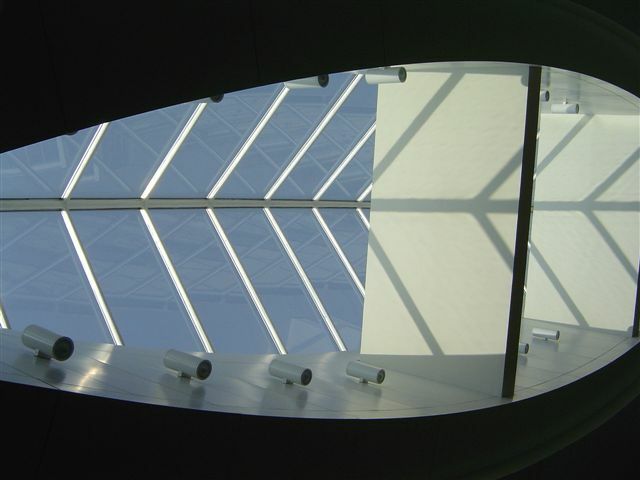 It is on the second floor of the airport. You can arrive there either by using the escalator on the right or the elevator in front of the gate. After you enter the long hallway, you will see the first sign on the top pointing to Maglev. 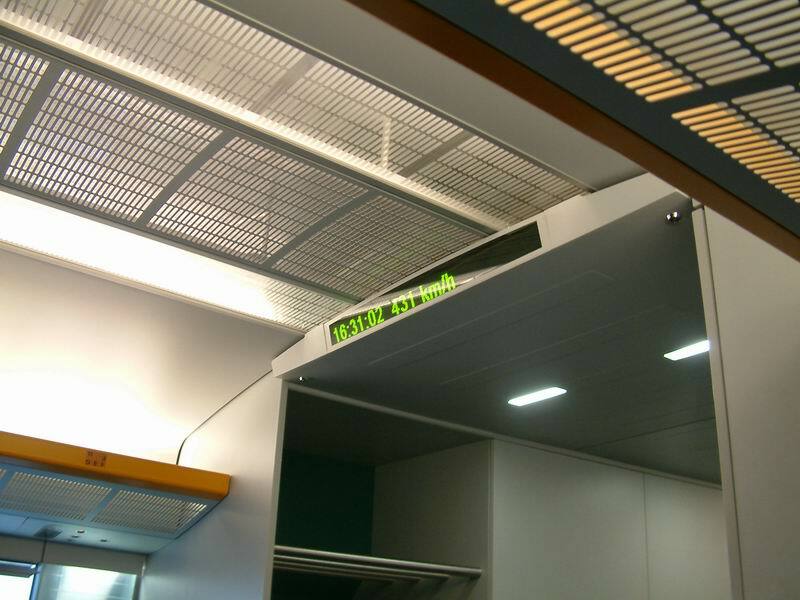 You can see the sign of Maglev Entrance with both English and Chinese name. The icon is interesting. 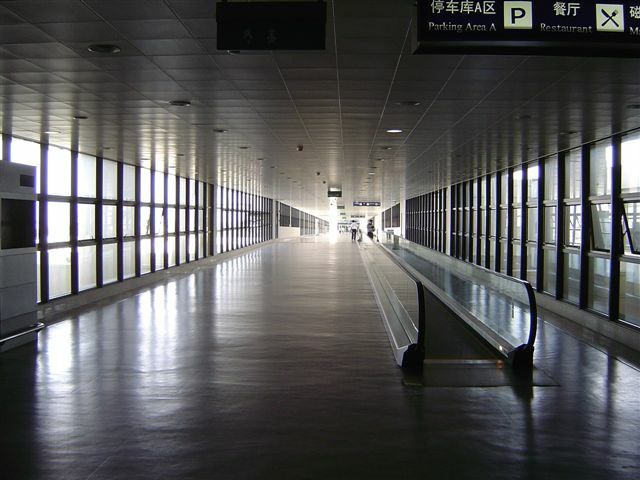 After you arrive the end of this hallway, you have entered the building of Maglev Station. 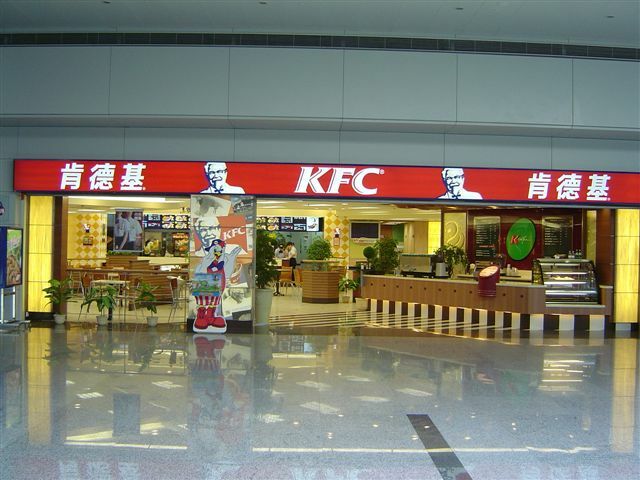 There is even a KFC restraunant there. It may be good choice if you are really hungry after the long trip. 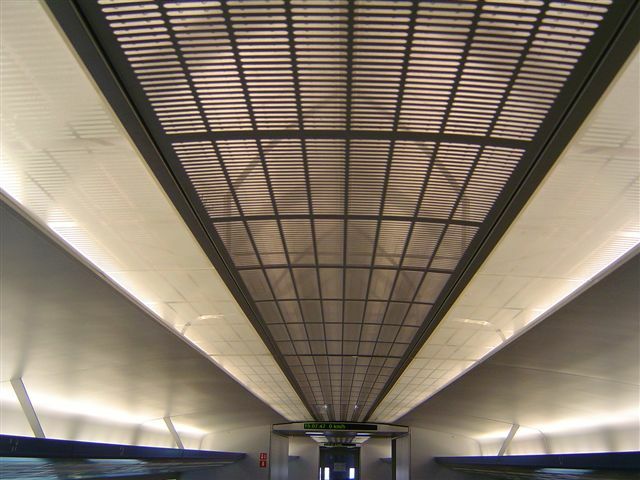 Below is the innovative roof of the Maglev Station. 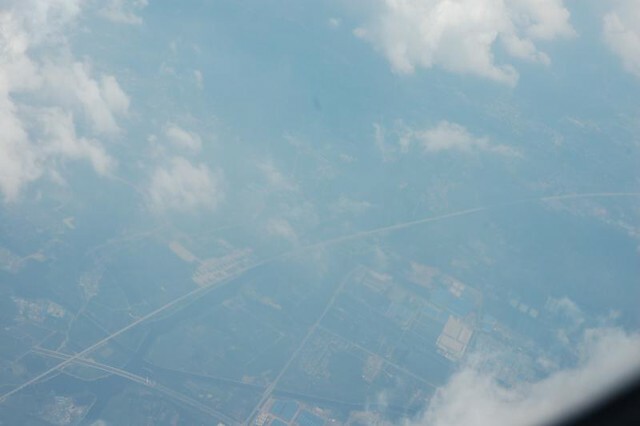 I happen to find out another picture I took after the plane just departed on my trip to Xiamen. It is highly appreciated if someone can share with others about your REAL experience to take the Maglev train – I haven’t get a chance to give it a try yet. Breaking news! 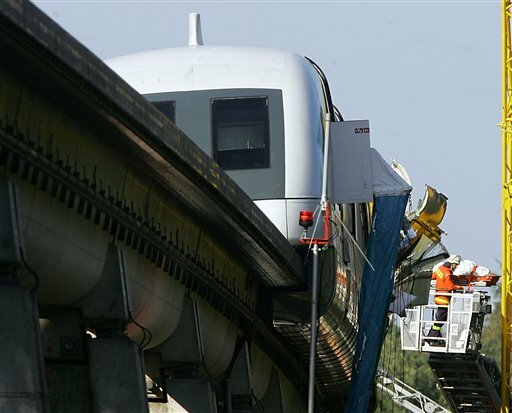 Maglev will begin real transportation from tomorrow. 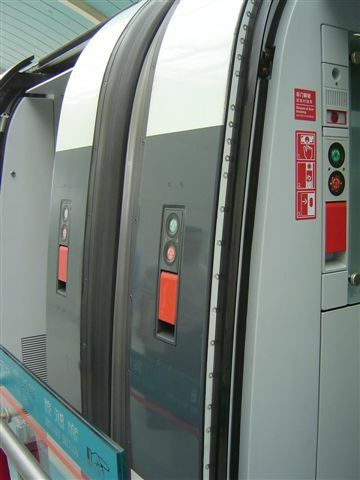 It is still the trail operation, but the difference is, from tomorrow, the train will open its door to drop passengers for the first time at Pudong Airport. 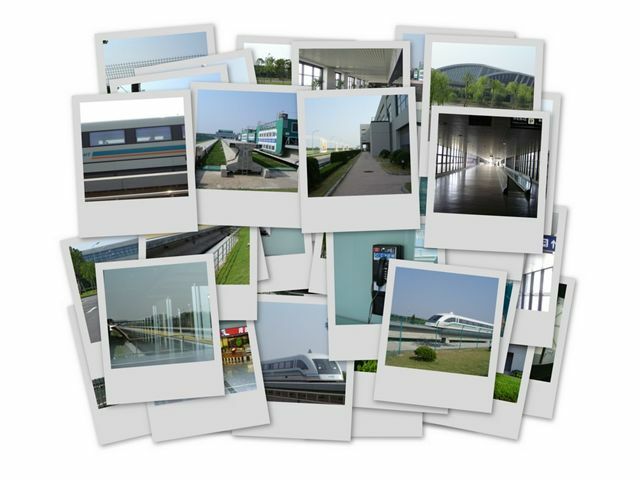 Before, the Maglev is purely operating for tourist. Passengers has to get on board the train and leave the train at the same station. It will directly return from Pudong Airport back to Long Yang Road after it arrives. From tomorrow, it will drop passengers at Pudong Airport. This trail operation only opens for six days, namely, Oct 11, 12, 18, 19, 25, 26. The price is 75 RMB and the interval is 20 minutes, starting from 9:20 to 17:20. Oh. 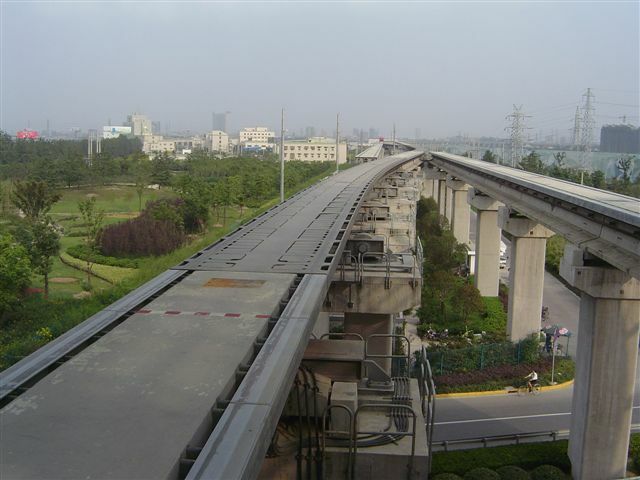 I forgot to let you know that MagLev begin to PICKUP passengers at Pudong Airport and Drop them off at Luoyang Road. So you can directly go to the Maglev station after you get off your flight. According to Shanghai Morning Post, 90% of the passengers getting on board the Maglev are foreigners. It seems the news goes faster to the ears of the foreigners than to local people.